I’ve had Veterans tell me that once you’re military, you’re always military and the VFW members in Hot Spring Village obviously believe that. 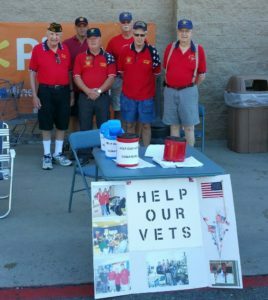 On a Saturday in September, they set up shop at the local Walmart and shoppers were encouraged to buy needed items or make cash donations for the Veterans at St. Francis House. By the end of the day, Hot Springs Village had made sure our Veterans were well clothed and ready for fall. Thank you, Hot Springs Village VFW for your service, both to our country and to your fellow Veterans.